From the rocky pinnacle of Lookout Mountain the view of Grandmother Mountain Roadless Area and beyond is so vast and boundless the ridges in the distance appear a hazy blue; mile after mile of forested hills. 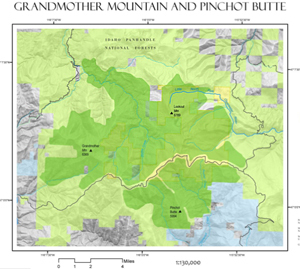 Management of the area is split between the Forest Service and the Bureau of Land Management. This 35,000 acre swath, located roughly 30 miles southeast of St. Maries, Idaho, makes up part of the ridge dividing the Clearwater from the St. Joe drainage, with some acreage under the jurisdiction of the Bureau of Land Management. The U-shaped backbone includes Grandmother Mountain, Grandfather Mountain, Marks Butte, Crater Peak, Lookout Mountain, and the ominously named Widow Mountain. The landscape conveys its unmistakable glacial history: steep slopes, rocky outcroppings and scattered moraines, carved bowls, cirque basins, and icy mountain lakes. The headwaters of Marble Creek, a major tributary of the St. Joe River, flow northward from the ridgeline. Flowing to the east are the headwaters of the Little North Fork Clearwater, essential and generative habitat for Westslope – cutthroat and Bull trout, stretching undammed until it reaches Dworshak Reservoir. There are 2,300 acres of the watercourse eligible for wild and scenic protection. The high elevation, geologic record, and past fire history are reflected in vegetation patterns. Nearly half of the roadless area consists of young, even-aged, and slowly regenerating stands of various evergreen types. Over the remaining forested regions old-growth cedars stand stately and dignified, graduating to reflect a sparser subalpine pattern as elevation climbs. 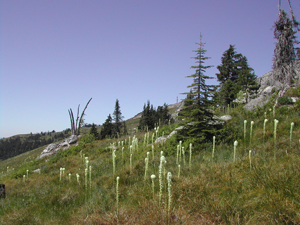 Mountain hemlock and subalpine fir lean with the incline toward the peaks, and scrubby brush fields of beargrass and lupine spread over slopes. Elk find substantial summer range here, cohabitating with black bear, whitetail and mule deer, wolverine, fisher, lynx, and other species common to the forest setting. A more than 300 acre Research Natural Area is set aside to study the incredible ecological value of the high elevation lakes and wetlands of this, and the nearby, Pinchot Butte Roadless Area. The interior is latticed with maintained and organized trails, affording hikes, campouts, horseback rides, cross-country skiing, fishing, huckleberry picking, and exceptional scenic viewing. Unfortunately, off-road vehicle use has left undeniable damage to trails and meadows, leading to restrictions on motorized transportation on several paths. The mountainous topography, sweeping meadows, varied tree cover, and array of traversable peaks allow ample opportunities for solitude and exploration. Were this region to be designated Wilderness, geographically it would be the closest wilderness to populous communities such as Moscow and Coeur d’Alene, and protection of the strikingly beautiful and ecologically rich landscape would be ensured.